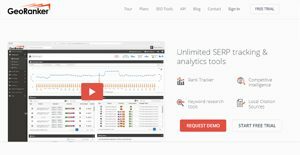 GeoRanker is specially designed to optimize business owners’ SEO strategy by way of analyzing local Search Engine Results Page, and represents a professional SEO management tool that aids users to determine their website and keyword ranking based on specific locations such as cities and countries. Geo Ranker allows users to view SERP as local users in over 50,000 countries worldwide. This SEO Management Software is using an IP-based Technology which is described as revolutionizing SEO strategy since local searches have been recently given priorities in SEO management. Since users have different IP addresses from different locations, local search results would be different for each of them. This is what is being utilized by GeoRanker and it is very helpful in locating and gaining customers for their business. Furthermore, GeoRanker is using local SEO tools that contribute to business growth as they provide local SERP research and analytics. GeoRanker has a distinguishable feature that tracks website ranking by multiple locations across the world. Displaying information through heat maps, GeoRanker’s Local Rank Tracker provides users the exact position in real time of their targeted locations. Different websites or URLs are assigned with colors. If a website ranks in Google 1st Page a lot of times in different multiple locations, the heat map would show the color distinctly, but if it just ranks in Google 1st Page for a specific location once, the color won’t be highlighted. The significance of this feature is that users would be able to determine which locations are giving high ranking to their website and thus they can devise local SEO campaigns that would maintain such ranking. On the other hand, they could check their campaigns for those locations with unsatisfactory results in the ranking. Another prominent feature of GeoRanker is its Citation Tool. Through this tool, users would be able to determine the sources of the most authoritative local citations used by their competitors. In addition, since it is very time-consuming to locate and establish local citations, GeoRanker helps users to find local citation sources and create citations to different websites to boost and optimize local SEO. This feature is very important to improve rankings since sources that provide accurate information about one’s business would definitely lead to higher probability of attracting more customers. GeoRanker also has keyword tools. With the aid of such tools users would be able to search for the most relevant keywords for their SEO strategy. The software would automatically suggest keywords that users can use. Another important tool is its keyword density tool. Since keyword density improves ranking by ensuring that web pages contain a sufficient number of keywords to improve ranking in search engines, this tool would aid users determine the keyword density of web pages so they would have an information as to the relevance of such pages for keywords they are ranking. With these tools, users would be able to gather relevant web pages that would promote their business and attract more customers. If you are interested in GeoRanker it could also be a good idea to investigate other subcategories of Best SEO Software collected in our base of SaaS software reviews. Enterprises have different wants and requirements and no software platform can be just right in such a situation. It is pointless to try to find a perfect out-of-the-box software app that meets all your business needs. The intelligent thing to do would be to adapt the application for your unique needs, staff member skill levels, finances, and other factors. For these reasons, do not rush and subscribe to well-publicized popular systems. Though these may be widely used, they may not be the ideal fit for your specific requirements. Do your homework, investigate each short-listed platform in detail, read a few GeoRanker reviews, speak to the seller for explanations, and finally settle for the application that offers what you want. How Much Does GeoRanker Cost? We realize that when you make a decision to buy SEO Software it’s important not only to see how experts evaluate it in their reviews, but also to find out if the real people and companies that buy it are actually satisfied with the product. That’s why we’ve created our behavior-based Customer Satisfaction Algorithm™ that gathers customer reviews, comments and GeoRanker reviews across a wide range of social media sites. The data is then presented in an easy to digest form showing how many people had positive and negative experience with GeoRanker. With that information at hand you should be equipped to make an informed buying decision that you won’t regret. What are GeoRanker pricing details? What integrations are available for GeoRanker? GeoRanker can be integrated with Plus.io, an application development platform and V.I.Plus, a marketing solution. If you need more information about GeoRanker or you simply have a question let us know what you need and we’ll forward your request directly to the vendor.